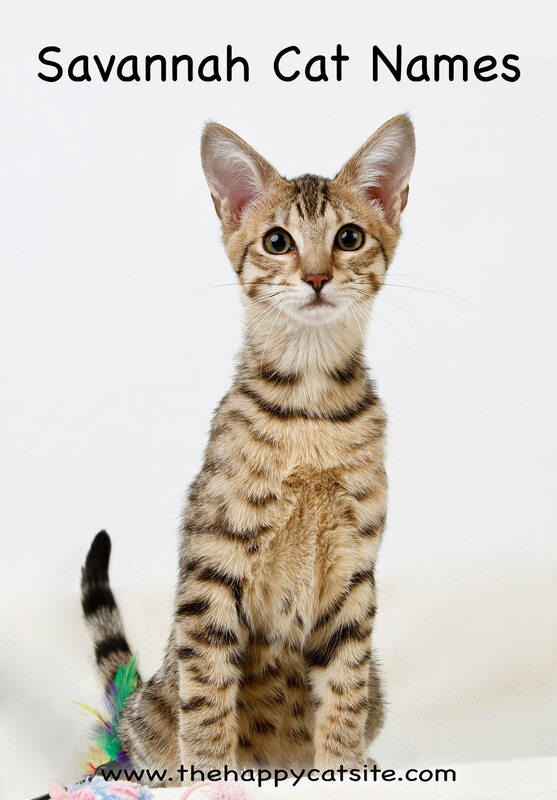 Are you looking for Savannah cat names for your new Savannah kitten? Or maybe you’ve rescued an adult Savannah? Having trouble coming up with a fitting name for your feline? Never heard of a Savannah but curious now? You can learn more here. Naming a cat is both the most enjoyable and hardest parts of becoming a new pet owner. 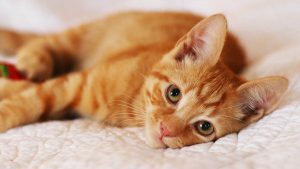 On one hand, there are just so many names out there and it can be incredibly fun to go through them and pick the best one for your kitten. At the same time, though, there are SO many names out there! It can be super difficult to sort through all of them and pick just one. You don’t have anything to fear, however, because that’s why we’ve made this handy guide! 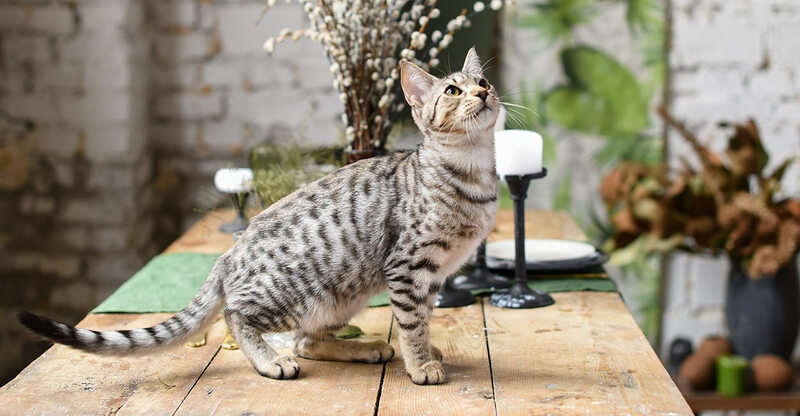 We’ve collected a number of names that would fit your new Savannah kitten; now you just have to pick which one you like the best! Savannah cats are a truly remarkable breed. They are hybrids between a domestic cat and a serval, which is a type of wild cat that lives in Africa. This cross breed produces a giant, wild looking domestic cat. These cats truly are the giants of the cat world. Savannah cats can fall anywhere between a domestic cat and a serval in terms of size, and they can reach upwards of 20 pounds. 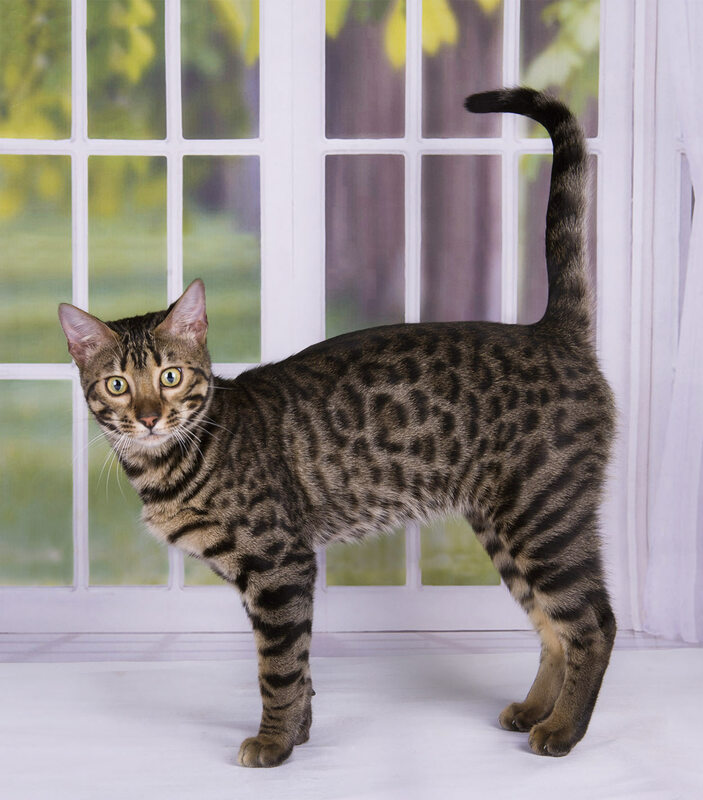 These cats also sport an incredible spotted coat – they really are beautiful and unique! Such a unique cat deserves a unique name! 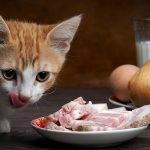 For any breed of cat, we recommend choosing a name with a maximum of three syllables, so that it’s easy for them to learn, and you to use in training. But other than that, there are no limits to where you can look for inspiration. 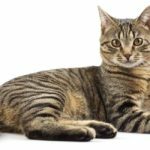 In the lists below we’ve chosen Savannah cat names for male and female cats, and looked for ideas from their ancestors’ African homeland. Grab a pencil and get ready to jot down your favorites! Have you become best friends with a male Savannah cat? Male Savannah cat names really come from a whole host of categories. From wild names, to names that refer specifically to his spotted coat, to elegant names. It really can go whatever way you feel suits your new kitty. There are just tons and tons of female Savannah cat names out there. There is everything from cute, adorable names to wild and ferocious names. From cute to sassy, you’ll find whatever type of name you’re looking for here! Savannah cats are a cross breed between an African serval and a domestic cat. So it only makes sense to include a list of fitting African names! 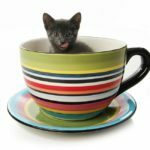 If you’re looking for an exotic sounding name, or are just looking for a unique name for your unique kitty, then this is the list for you! However, if you’re tempted to use a name from this list, there are a couple things to keep in mind. 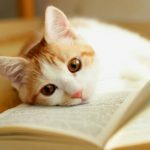 Some of these names are somewhat hard to pronounce for English speakers, so you might want to make sure that you can pronounce the name easily enough before deciding give it to your cat! Plus, if you have small children in your household, make sure they can pronounce it too! Savannah cats truly are known for their amazingly spotted coat. It really is one of the tall-tale traits of this breed. And is often times the first thing that draws many cat owners to them! So it only seemed fitting to include a list of names specifically inspired by their amazing coat. If you’re looking for a name that is both very fitting and not necessarily very exotic, then this is the list for you. What’s more lots of these names can be used for both boys and girls. There are lots of possibilities when it comes to naming your new Savannah kitty! You could go with something exciting and exotic, like a name from Africa. Or you could choose an adorably cute name. It is really just whatever suits your tastes. Remember, naming your new feline should be a fun experience. So don’t stress about it too much, the perfect name will come to you. Of course, the perfect name for your kitty is, obviously, whatever name you decide to give him or her. They are your cat after all! What Savannah cat names did you choose? If you already have Savannah cats at home, what are they called? Please tell us in the comments section below! I named my male Sevannah kitten “Juju.” He learned it immediately. My female Savannah is Eve short for Evening and my male Savannah is Roary Short for Roarin.